If you go up to any random person in the steet and ask them, “Who is the best director of all time” or “Name your favorite directors,” 90% of the time, they will answer with a certain name of a particularly unique director. This particular name just happens to be Steven Spielberg; one of the most inspirational, insightful, creative and groundbreaking directors of all time. There are various reasons for Spielberg’s world spanning fame; One of them being that he is one of the few directors who can make films that are critically acclaimed and beloved by audiences as a plus; a rare feat not even accomplished by quintessential directors such as Scorsese. There are many reasons Spielberg is able to pull this off. The first main reason for this rare feat is due to years and years of worshipping movies. 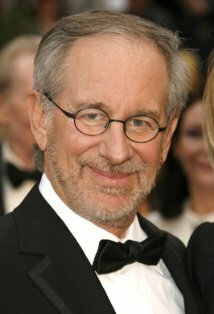 For a lot of his childhood, Spielberg was born in Cincinatti, Ohio on December 18, 1946 to a Jewish family. When he was 5, his dad took him to see his first movie, which was the award winning “The Greatest Show on Earth”. This led him into his decade spanning interest for film, making his first film right after the movie, mocking the movies famous train crashing scene with his own mini train set and Super 8 camera. Getting into middle school, he created his first longish movie called “Escape to Nowhere” (1961) a 42 minute World War II action flick which he shot with his middle school friends and his sister. His first serious film though was called “Firelight”, a 400 dollar, 2 hour and 20 minute production that was both his first commercial success (making a 100 dollar profit) and was the first rudimentary version of “Close Encounters of a Third Kind”, one of his most famous films and what still remains a classic to this day. When Spielberg’s parents got divorced, he and his father moved to California, a true benefit to him due to his undying love of movies, but a very sad occurrence which is mirrored in many of his films including E.T. (there isn’t a father in E.T., symbolizing both the traumatizing divorce and his lack of connection to his dad). It’s this personal filmmaking which is a small part of why his films are so widely known; almost any human can relate to even just minor details in his films, which is not something you can see everyday. Spielberg had an interesting method of how to get into the movie business. Instead of going to film schools, to which he was repeatedly rejected, he actually went on the tour of the Universal Studios, and instead of actually taking the tour, he escaped, even setting up a phone and a desk in an empty office, working as the staff without anyone knowing that he wasn’t actually on the staff. It’s his crazy commitment to film which is another reason for his undying fame; while others will go 90%, Spielberg would go 150% and actually sneak into a movie studio office to just be able to work with movies. When the Universal executives figured out what he was doing, they also learned of his undeniable talent as a filmmaker as he went on to direct some of his first movies, such as the TV Movie “Duel “(1971), and then the acclaimed film, “Sugarland Express”. It was after “Sugarland Express” Hollywood execs. could tell he was ready to handle a big project. Now this “big project” just happened to be the horror classic “Jaws”. “Jaws” was a tremendous success in the summer of 1975, that it literally created the term for blockbuster, being the first one in film history making over 200 million dollars (which was a lot more back then, due to how much money was worth and reduced ticket prices). Spielberg ingeniously didn’t show the shark from jaws until over halfway through the movie, building and building up the suspense to a peak, being something pure genius that has been used in horror flicks ever since. Another important reason why audiences loved Jaws was its incredible score by John Williams, who has done the music for every single Spielberg film since except for a select one or two. In cooperating with John Williams, Spielberg has indirectly gave us some of the best/most famous movie themes, such as Indiana Jones, E.T., Schindlers List, Close Encounters, and of course, Jaws. It is also through music that the Spielberg/Williams combo have created their enterprise of universal fame, as Williams incredible music and Spielbergs incredible movies dovetail perfectly. Spielberg went on to direct his passion project, “Close Encounters of a Third Kind” next, also becoming a hit. Then, sadly, Spielberg made a terrible movie that almost put his career to a hold…. This particular film was called “1942”, and it was a gigantic flop in the box office, almost permanently scarring Spielberg’s reputation. His next movie saved him for life though. The name of his next movie was “Indiana Jones and the Raiders of the Lost Ark”, and it is one of the best movies ever made, hands down. It made a fortune at the box office, had an incredible score, ingenius action sequences, a once in a life time plot, and an incredible performance by Harrison Ford, who singlehandedly creates one of the most revolutionary action heroes of all time (Indiana Jones). This movie did so well, that even as an action film, it was nominated for prestigious awards such as Best Picture, Best Director among others at the Academy Awards, which is something never given to an action film. “Raiders” spawned three sequels, and is further proof of Spielberg’s ingenius filmmaking that both kids through adults can equally enjoy. After the 1980’s, Spielberg entered a period of making both critically acclaimed favorites and summer blockbusters alike. Starting off in 1993, Spielberg directed both “Schindler’s List” and “Jurassic Park”. Schindlers List was a much more mature film, telling the story of Schindler, who saved over 1200 Jews from the concentration camps. This film was incredible, still known as one of the greatest holocaust films ever made, and revered as one of Spielbergs greatest creations, winning him Best Director and Best Picture at the Academy Awards. Jurassic Park, on the other hand, was a perfect example of his constant draw to the summer blockbuster, being about an island where they reconstructed dinosaurs from their DNA, except it goes very wrong, very quick. These two movies are perfect examples of Spielberg’s unattainable talent to making films of all sorts of variety. He shows perfectly in both of these movies that he can make a perfectly fun, well made summer blockbuster, and can also make an amazing, poignant drama in the same year. Spielberg went on to direct tons of other classic movies, such as “Saving Private Ryan”, “Catch Me If You Can”, and many others. Overall, there are many reasons to why Spielberg is such an incredible director. You could say his personal touch, his universal approach, or his amazing ability to just create the everlastingly entertaining movie that will stay with you forever, and each one can be right, because he is Steven Spielberg. For these reasons, he remains one of the greatest directors of all time. Now that’s an interesting perspective as I’d be willing to bet that if 100 random people in the street were to be asked your opening question, at least half would say Alfred Hitchcock. that is a good point, only if the people you are asking on the street are have at least a reasonable knowledge of movies. I love Alfred Hitchcock as a director, i think he is brilliant, but think about it this way: Most of the people who have seen and appreciated Alfred hitchcocks movies i’d say would be in their late 20s and onas most kids have not seen his movies. The reason why most kids haven’t seen his movies is due to the fact that Spielberg’s films are universal, something that even someone at the age of 8 could appreciate. Also, at least by my example, parents will usually show you a movie like E.T. or Raiders of the Lost Ark before they will show you North By Northwest or Vertigo just for the reason given above. That leads to an appreciation stemming from childhood of Spielberg’s movies (which he keeps making as i might add, while sadly Hitchcock can’t), making it most probable that people will say Spielberg in front of Hitchcock.